This page contains specific Epson Stylus Pro SP 4880 info that we get. See our 4880 review for latest information. November 2007 The new inks in the 4880 are not quite the same as in the 11880. See the 11880 page for details, along with why the newest inks won’t go in your older printer. Some additional info about the new printers, in that Mac OS X 10.5 ‘Leopard’ (due in October) will feature a 16 bit printing subsystem. The new x880 series printers will have drivers that can take advantage of this feature. The normal print driver (say with Photoshop or Lightroom) can send a 16 bit data stream to the printer. The new vivid Magenta inks offer a larger gamut than the existing K3 inks. The new inks can now reach process colours such as Rhodamine Red and Reflex Blue that were previously hard to match for ink jet prints. The Epson Stylus Pro 4880, 7880 and 9880 feature Epson’s breakthrough pigment ink technology, UltraChrome K3™ ink with Vivid Magenta and improved image processing. They provide an enhanced colour gamut and superior tonal gradation, ideal for the professional in the proofing, photography, fine art and graphics markets. 17 July 2007 – Epson launches three new large format, eight-colour professional production printers. They are the 17” (A2+) Epson Stylus Pro 4880, 24” (A1+) Stylus Pro 7880 and 44” (B0+) Stylus Pro 9880. Each features Epson UltraChrome K3 ink with Vivid Magenta technology, the latest development in pigment chemistry, which offers a wide colour gamut and unrivalled image quality from an 8-colour inkset. Epson’s new large format range provides the highest quality output that is required for the fine art, photography and proofing markets. A new Ethernet interface is included as standard and delivers fast, efficient connectivity and data transfer speeds. The improved printhead further enhances image quality and when combined with Epson’s Super Halftone Technology, a new screening algorithm, it delivers sharp detail and accurate colour reproduction. The Epson large format printer range offers superior media flexibility and is compatible with a wide range of Epson paper up to 1.5mm in thickness. Glossy paper, matte paper, matte board, fine art paper and plain paper are all supported. The Epson Stylus Pro 4880, 7880 and Stylus Pro 9880 include a roll holder and cut sheet support, as standard. The Epson Stylus Pro 4880 also features a paper cassette feed mechanism for high-volume production on cut sheet paper from A4 (Letter) to 17” (A2+) wide. Also new is an enhanced cutting sequence delivering a faster and more productive printing workflow. The UltraChrome K3 with Vivid Magenta further expands the already wide colour gamut of UltraChrome K3 and is a breakthrough in pigment chemistry. The full inkset includes nine ink cartridges: photo black, matte black, light black, light light black, cyan, light cyan, yellow, vivid magenta and vivid light magenta. The two magenta inks use new high-density pigments that create more vibrant colour, especially blues and magenta, for example those found in seascapes or landscapes. The UltraChrome K3 ink with Vivid Magenta, enables superb grey balance and precise colour without any colour cast. It also maintains the superior features of the UltraChrome K3 ink such as great colour accuracy of neutral and dark colours, excellent short-term colour stability and smooth tonal gradation from shadow to light. The issue of metamerism is virtually eliminated with this new inkset. The permanent Epson Micro Piezo™ printhead also offers unrivalled consistency in each print. Every print will be the same as the first, even if the artwork is printed months apart, making it ideal for studios producing limited edition print runs. Epson is also launching MyEpsonprinter.eu. This new online portal allows Epson Stylus Pro owners to retrieve up-to-the-minute technical information and monitor the performance of each printer. The secure website allows users to view print job activity, hardware information and historical data, and tracks key performance indicators such as cost of ownership and cost per print. MyEpsonprinter.eu can also be accessed remotely by service contractors to quickly identify the cause and scope of any queries, which saves time in unnecessary call-out fees. 11th It’s a 4450 and 4880 for September. On the B/W side the driver offers neutral, cool, warm and sepia toning options, along with a custom setting for your own choices. There is also a special black ink change conversion kit/cartridges included with the printer (p300, 386), the manual devotes several pages to the process and points out that quite a bit of ink ($$$) gets used. This sounds suspiciously like the official way I could change inks on my 9600. There was some question as to whether the printer driver supports sRGB or Adobe98 from its driver. EPSON Vivid. Select this setting to produce vivid blue and green tones in printouts. Note: Because this setting reproduces blue and green tones that cannot be displayed by your monitor, your printouts may differ from the screen images when this function is selected. Charts and Graphs. Intensifies the colors and lightens the midtones and highlights of an image. Use this setting for presentation graphics, such as charts and graphs. For EPSON Stylus Pro 4800 only: Increases the contrast in images. Use this setting for color photographs. For EPSON Stylus Pro 4800 only: Matches image color to Adobe RGB. • Proprietary Active Meniscus Control (AMC) technology precisely controls the curvature of every ink droplet within each nozzle before releasing it onto the media. The result is extremely sharp and accurate placement of ink droplets for outstanding photographic print quality. In order to ensure consistent printing between multiple Stylus Pro printers of the same model, Epson has enhanced the production process to include colorimetric calibration. This system evaluates and adjusts each printer’s difference at the manufacturing stage, assuring you of consistent color output from printer to printer. 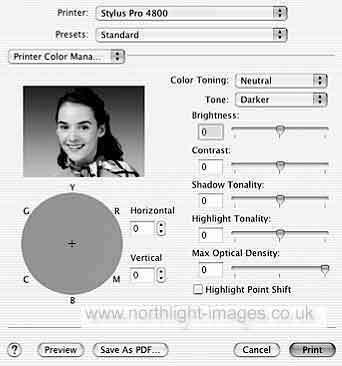 • Aligns both single and bi-directional print modes. Printer can utilize two different black ink modes – Photo Black or Matte Black. This innovative solution optimizes the black ink density for various media types, dramatically improving the final print quality. The standard Photo Black ink mode can be used for any media type with professional results. 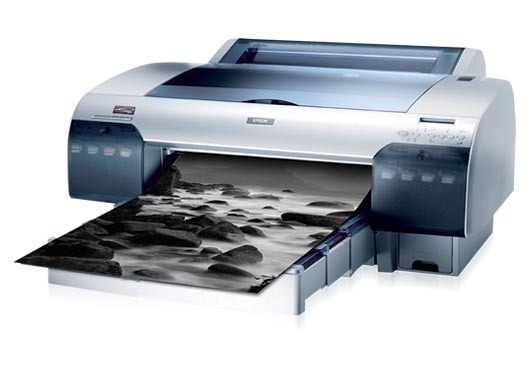 However, for certain Epson media types such as Velvet Fine Art, Enhanced Matte, and UltraSmooth Fine Art, using the optional Matte Black ink mode instead, will dramatically increase your black optical density for even better print quality. The Epson Stylus Pro 4800 utilizes our latest print head technology – making it one of the fastest printers ever made by Epson. The following information represents the highest quality print modes for three popular print sizes. • SuperPhoto — 2880 dpi produces an 8″ x 10″ in 6:25, 11″ x 14″ in 10:55, 16″ x 20″ in 18:57. • 8″ x 10″ prints from 50 secs to 6:25 – Normal is 3:17? • 11″ x 14″ prints from 1:44 to 10:55 – Normal is 5:35? • 16″ x 20″ prints from 4:07 to 18:57 – Normal is 9:46? • Color: Up to 108 years? • B&W: Over 200 years? • Normal mode based upon SuperFine – 1440 dpi Test results based upon print engine speed only. Total throughput times depend upon front-end RIP, file size, printer resolution, ink coverage, networking, etc. • Ink lightfastness rating based on accelerated testing of prints on specialty media, displayed indoors, under glass. Actual print stability will vary according to media, printed image, display conditions, light intensity, humidity, and atmospheric conditions. Epson does not guarantee longevity of prints. For maximum print life, display all prints under plexi, glass or lamination or properly store them.